I also thought of a creative use for the iron grid thing you get with those disposable barbecues. To use it as a frame/mount for one of my collages! If it rusts through a bit, it will just add to the effect! There are quite sharp edges, however, so I decided to wrap thread round them and bend the sharp edges over using pliers. Here it is so far. I’ve decided to weave threads diagonally across too. I’ve just done one green one so far but intend to do a lot more. The rough edges need a bit more smoothing – any suggestions for good ways to do this? Or what I SHOULD have done? (I’ve got another of these grids which I’m intending to use for another one). What do you think of this ‘found objects’ method of mounting?! Any comments welcomed! This is it with the collage piece sitting on it. I need to zigzag round the edges. 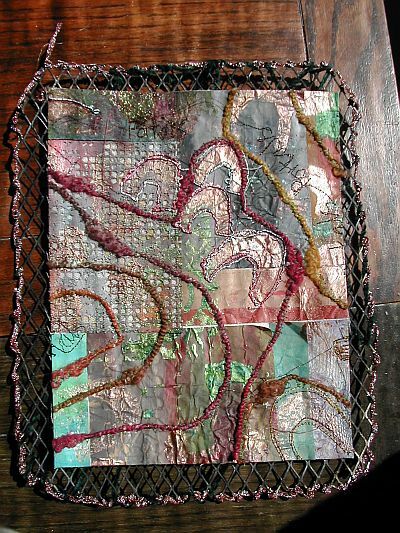 I think I will attach it by stitching it to the grid in four places. 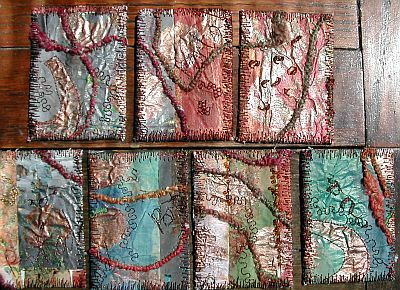 There are a lot of arches and things in these collages and ATCs (they are all the same piece cut up) and I have stitched ‘portals’ all over it. These are beautiful Liz! I love them. As far as the edges on the metal, I’ve never worked with that kind of metal, but it’s probably been tempered, so I imagine you couldn’t smoothe the edges by melting them with a blow torch because it would take more than high temps. How about coating the edges in something like polymere clay (then bake it to harden), or a few coats of nail polish, or Polyurethane, or perhaps dipping the edges in melted wax? It really looks wonderful. & I love the word Portals! I’d LOVE to swap an ATC with you! I LOVE the metal background….gosh now there you go giving me another idea and more things to look for at the dump! People will be wondering about me soon!!! LOL. Do you know someone who can sand metal….and maybe they can smooth out the edges for you. These ATC are absolutley goregous, brillant idea to use the screen. Thanks so much for sharing them.. It remembers me as I was at Haystack Mountain School of Art in the States we had to work with pieces found in the dump. 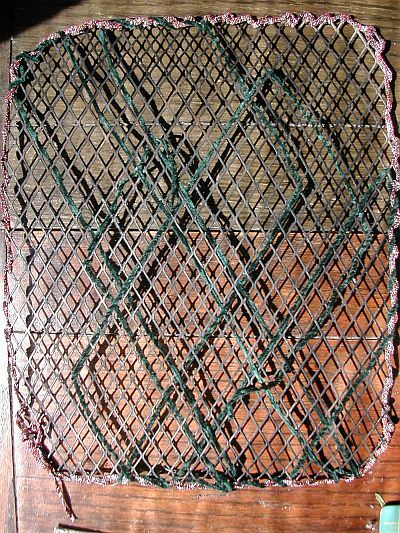 I felted a metal grid into a piece and it looked great. It was easier to do it because the holes were bigger though! Your use of it is very interesting!! Your ATCs are lovely! You’ve got such a great eye for colour and texture. I really like the idea of using found objects for mounting. It’s really inventive and the grid marries really well with your design. Very original!